Copper brown on on medium to light colored hair will be auburn. As you dye your hair and it gets darker, you can switch to pure henna natural red to keep the auburn look. If your hair starts to get more red, you can go over it with copper brown to darken it up. If your hair is darker and you want it lighter please see our lighten your hair in 48 hours naturally page. It is very easy to remove henna this way, however not chemical hair dye. Our copper brown does not have to match your exact color, it will in fact cover white and gray hair and blend naturally, it is a great look for the natural “ginger” effect on lighter red hair. You can mix copper brown with any of the other colors to make it darker or more red. If you have strands of gray or white, you can do your entire head and it will highlight those lighter strands. If you are all white the color “might” come out more red. This is not the case for everyone, more so for people who have bleached the hair white or blond, white or gray hair. Do a strand test to learn which is the best for you. If the first time you do it and it is to much red, you can apply it again. Always give it 24 hours as it will get darker. Once you have established your color, simply do root touch up as needed, getting to brown? 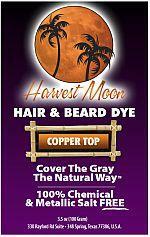 Then just use Harvest Moon natural red, getting to much red? Then use light or medium brown or mix them together. The more you use it the easier it will be.